Definition: [PEH-tee fohr; puh-tee FOOR] 1. Any of various bite-size iced and elaborately decorated cakes. 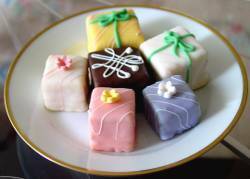 Petits fours can be made with any flavor cake, though white and chocolate are the most common. 2. The French also use this term to describe small, fancy cookies. Preheat oven to 350 degrees F (180 C). Grease and lightly flour a 9-inch (23cm) square baking pan. In a large mixing bowl, cream the butter, shortening and sugar. Beat in the vanilla. Combine the flour, baking powder and salt; add to creamed mixture alternately with milk. In a small mixing bowl, beat egg whites until soft peaks form; gently fold into batter. Pour batter into prepared baking pan and bake at 350 degrees F (180 C) for 20-25 minutes or until a toothpick inserted near the center comes out clean. Remove cake from oven and let cool in pan for 10 minutes. Turn cake out onto a plate or cooling rack; then chill cake in refrigerator for at least 30 minutes. Remove cake from refrigerator. Cut a thin slice off each side of chilled cake. Cut cake into 1-1/4-inch (3.175 cm) squares. Place squares 1/2 inch (1.27 cm) apart on a cooling rack over a 15 x 10 x 1-inch (38cmX25cmX2.5cm) pan. Apply fruit glaze (See Fruit Glaze Preparation Below)) evenly over tops and sides of cake squares, allowing excess to drip off. Let dry. Repeat if necessary to thoroughly coat squares. Let glaze dry completely. In a medium size saucepan, heat preserves with the 3 tbsp. water on low heat. Drizzle or spread a thin layer of heated preserves over cooled tops and sides of petit fours before icing. (If using jelly, you do not need to add water to it, just heat jelly in saucepan on low heat and spread over cooled tops and sides of petit fours). Combine all icing ingredients in the top of a double boiler. Heat over boiling water to lukewarm. Pour icing over tops and sides of petit fours. Once they are set, they should be coated with icing again. After icing hardens, decorate tops of each petit four with a tiny edible sugar flower and/or leaf. Makes 2 1/2 dozen petit fours. Petits Fours may be made up to 24 hours in advance. Let the icing (or if using a fondant frosting) dry completely before storing in an airtight container. Refrigerate petit fours if they contain perishable fillings and icings, such as dairy products or fresh fruit or berries. The fruit preserves or jelly used in the filling of these petit fours can go bad after 2 or 3 days because of the moisture from the wet fruit filling, so storing them in an airtight container at room temperature for more than 2 days is not advised. 1). You can separate the icing, once it's made, into small bowls, and tint each with a different food coloring, adding color until you achieve the desired shade. 2). Icing colors that look nice for petit fours are: White, Pale Yellow, Pale Pink, Pale Blue, Pale Green or Lavender. 3). You may also drizzle melted white or dark chocolate over tops and sides of petit fours instead of using the white or tinted icing. 4). Another idea is to sandwich two of the cake squares together with the heated preserves or jelly glaze; then pour icing over the tops and sides of squares, then decorate when icing has hardened completely. Note: Fondant icing can be used to cover these petit fours instead of the glaze above. See recipe for "Fondant Icing" under the "Cake Decoration" category on this website. This recipe took 4 hours and was EXTREMLY sweet and was very disappointing. easy to follow directions. turned out right the very first time. Great recipe! Petit Fours are supposed to be extremely sweet and you can tell by their appearance that they are going to be time consuming! Don't expect easy when they look this good! Sweet and delicious! Takes time, (which I fully expected!) but the results are amazing. Found the frosting way too thick, even after fully heating it. Thinned it, but still could not get it to coat the cakes without being bumpy. You need an experienced hand for this. I was so Happy to find this recipe. It's great and worth the time too make it. Time consuming, yes; delicious, even more so. This recipe was hard, but after it was over, it was worth it. This recipe is great! followed it to a "T" and it turned out perfectly, just like the picture. One piece of advice...cut off all 4 of the sides of the cake that are 2", do not cut off the top or bottom. Less crumbly and more square this way. Try it, but make sure that you set aside a good amount of time. Well worth it though. We worked hard on this recipe and while the cakes were good, we never did get them completely coated in the icing no matter how many different ways we tried. There must be some trick to getting them so smooth and pretty. Also the jelly never did "firm up" once it cooled. Had anyone here tried using the quick pour fondant or the rolled fondant? Only wish I had the time! poured fondant icing works wonderfully! rolled would be impossible. Very good! Took a while, like I expected. Did not turn out looking like picture ,but was Delicious! Fondant recipe did not work at all, ended up making a different type of icing. Looked nothing like the picture, but pleased the little kids and was tasty. Loved the recipe, will probably use it just for a cake. Never will use that Fondant recipe though. :( Thanks. The key to this recipe is to have LOTS of time to prepare the cake and to leave it in the refrigerator overnight if possible to tighten the crumb even better and that way get a smoother surface for pouring the icing. The other thing I did was I used a dipping spoon (or fork) to hold the cake and poured the icing on top using a bigger spoon; worked like a charm! They're not perfect but they are very nice looking. My little petits fours are very pretty and tasty, too. The only thing holding me back from giving this an excellent is the taste of the icing. It tastes too much like fondant (which I'm not a huge fan of), but I expect that to be the case. Next time I'm trying chocolate. I, too, had issues with the icing. I am a very good baker and great at decorating. The instructions need some work here! Mine ended up looking like the other lady's on here, non-fab. I will look for another way on another site. I'm sure you're really great and all, but this recipe needs a little more instruction on your part. Someone needs to tell the secret of making gorgeous petit fours - it's your FREEZER. Slightly cooled cake should be placed on a wire rack and placed into a freezer (with lots of room). Once the cake is HARD - you can cut it without the crumbs! (freezing also seals in the moisture). If you don't believe it - try it on ANY cake. Back to petit fours - after cutting into cubes, etc. - make sure to place BACK into the freezer until you're ready to frost or decorate. Jen--I looked at your final product and Good God Girl!!! What did you do? Hahahahaha...I'm sorry for laughing, I know you probably spent lots of time on them, but you really debauched them! Maybe try putting your cake in the freezer next time, and also try the already made fondant. Dear Di, Your expertise with the oven compares only to the sweetness of these petit fours. Keep doing what you do and dont change a thing! Disregard the doctors warning about your diabetes...keep hittin the sweets 24/7 darling. Oh my! I looked at Jen's picture. I laughed so hard my toddler started laughing with me! I am planning a tea party for my little girl and your picture scared me out of trying this. Bakery, here I come! if i was doing this again, which i wont, i would first coat the cakes in a crumb coat of regular decorators frosting, then pour the glaze over that, the crumbs get into everything, even when i have kept them in freezer. what a mess. this is not a recipe for beginners, and i am not a beginner. For those of you who think the icing is too sweet and too thick, my guess is that you packed in the powdered sugar like brown sugar, which would give you almost twice as much as the recipe calls for. It should be measured like flour, spooned into the measuring cup and leveled off with a knife. If this sounds too involved, you can also measure by weight instead of by volume. If you found the cake too dense, I would bet that you mixed the egg whites instead of folding them in. If this is a problem you've had consistantly, you might get better results with a cake recipe that uses baking powder as the levening, or even a boxed cake mix. Nikki - It's always possible to subsitute one flavoring for another, so you can certainly add lemon or orange extract instead of the vanilla. I can't bake, so i emailed the recipe to my sister (who is also my caterer for my special events I hold, i.e. Tea Party Tuesday.) I was tired of running to the bakery and buying petit fours. So, when Tuesday came around, I was pleasantly surprised when amidst the cucumber sandwiches and crumpets were small petit fours decorated like tiny gift boxes! Needless to say, they were a hit! My other Tea Ladies ordered them for their garden parties! A word to the wise though. If you want less crumbs, try brushing the cake in a brandy simple syrup instead of the jelly. And something is said for a chocolate ganache as well! Use your imagination and you'll LOVE this recipe as a building block!!! I used a boxed cake to cut down on some time. If you spread the fruit glaze with a pastry brush, it is very easy...a little messy, but good. I had problems with getting the icing on all 4 sides though. My cakes didn't make the party I made them for, but they sure tasted good! I'm considering trying out this recipe. What do you think baking the cake in a mini brownie silicone pan would be? This way they would already be sized.. Opinions? This is a rather difficult recipe. The cake was a little sticky, even after freezing. I would recommend rubbing the sticky parts off the top and bottom before freezing. Also it might be better to bake the cake in thin layers instead of cutting? And about the icing... it was hard to manage. I got some interesting looking petit fours but nothing as bad as the other person who wanted to scare everyone away with her picture. Also, the cakes are really sweet. I think decreasing the sugar in the cake is in order. I was searching for this recipe for a long time to found which ones are suitable for my taste. I've been trying so hard and it works!!! The cakes are so tasty, I create my own icing with the new shape. And I love it. My friends are addicted to it.....how's that sound? I love making cakes and I love decorating them even more. Yesterday was my first time making petit fours. This recipe looked okay, so I went with it..... and I am so glad I did. They came out perfect. The cake was simple, easy to make, and light (I don't know how anyone else's turned out dense). I think I cut mine a little too small, but other than that, they came out looking as pretty as the picture. The decorations on top took the most time but it was worth it. Everything else was pretty easy. I thought I would have to keep re-coating the cakes with the icing but one coat was enough and they were BEAUTIFUL. Thank you so much for this recipe. I think I was lucky to get them right on the first try. To everyone else.... "if at first you don't succeed try try again". One trick I learned in my high school cooking class: add white vinegar. You might not think it would ever be a good idea, but it really makes a super smooth texture (and adds no taste). I add about a tsp per box of cake mix, or per layer cake; 2 tsp. for a 2-layer recipe, etc. The vinegar interacts with the gluten in the flour and bonds it well. I never have a crumbly cake. Also, it helps retain moisture. All the things you want in a cake: moisture, texture, and unalerted flavor. Ladies, I cant believe the MOST vital ingredient is missing.....you MUST roll out marzipan, very thin, placed on top of the jelly BEFORE you ice, thats how you get a really smooth finish. It alo helps to cut some of the sugar so you are not gasping after the first bite. This receipe was INSANELY Sweet. they look wonderful, I used to make some years ago, but my recipe (a german one) only called for powdered sugar, and definitely marzipan. I think I will try making them again for a retirement party! I made petit fours for the first time today. This recipe was good except for the fruit glaze, it never really hardened. I ended up leaving the glaze off of half of the petit fours. I also noticed that the glaze works better once it has been heated to an almost liquid state. Tweeking this recipe for beginners (get really technical with everything, lol) would be great. I will definitely try this recipe again. I think that this recipe takes time but at the end of the day it shows a lot of skill and the outcomes is great!!!! I will stick to ordering mine from online. Can't go wrong. The lady's picture scared me to death in making these. I am not a baker and I want something quick fast and in a hurry for a busy single, working, mom. I love Diana's Deserts. I try some of them, but OMG! Jen, you're scaring everyone away! Clearly you did not follow the recipe as it is written. Your icing would've gotten thinner if it was warmer. Also, your fruit glaze is way too thick. I do agree with the other reviewers that said this recipe is too sweet. The cake is delicious on it's own. It's not dense at all, so to the folks who got that result maybe you should read up on Cake Baking 101 and try again? I believe the reason these petit fours are so sweet is the amount of icing it takes to completely coat the cakes so they're not see-through. They are so sickeningly sweet, I had to through them away. Mine looked nothing like the picture on the website. Who in the world would bake the cake from scratch. I haven't even made the recipe yet but it sure looks fantastic. If you don't love sweet don't make petit fours. That's the point-SWEET! These little cakes have always been tricky little rascals to make. These instructions..believe it or not...are some of the simplest I have ever found. Some knowledge of baking is required to make it work. Freezing the cake before cutting or icing, using the two spoon method, double icing each piece making sure the icing sets between 1st and 2nd application of icing, brushing the cake with glaze before icing, are all helpful. Vinegar in the cake mix..an oldie but goodie method of de-crumbing a cake. For anyone thinking that making petit fours are like whipping through a batch of cupcakes...I laugh out loud... Have you priced petit fours!! That is why they charge sooo much for a tiny little box. Do yourself a favor. Bake them one day...frost and decorate the next day. It isn't something you would want to rush. And yes..they can look perfect and professional. If you take your time, take them out of the freezer a few at a time, and double dip them. The little decorations can make them or break them on appearance..so don't cut corners on the little flowers you decorate them with. That is not the time to get tired of the whole task and get sloppy. Some recipes add Karo white syrup to thin the icing. If your icing is too thick, search out methods to thin it to a pouring consistency...do this before you need it. Then you will be ready if the situation comes up and you wont be caught with thick icing at the wrong time. If your icing is too thick..don't try to dump it on the cakes. Keep the cake in the freezer until you get the frosting to pour right...then proceed. If you use this common sense step, you wont be tossing whole pans of cake in the trash. It's a good recipe, but probably not one for a beginner baker with no common sense. What a time waster! I find it interesting how one recipe could yield such inconsistent results.I've decided that some important details were omitted-- details that only someone who had made these before would know. I'd like to see the recipe directions re-worked to include some of the reviewers' helpful comments and suggestions, (wish I'd read them before getting started!) I am an experienced baker and thought these would be pretty to bring to a tea party at work. Having never made Petit Fours before, I took my time and followed the recipe precisely. I measured exactly (and I didn't pack in the confectioners sugar!). My Petit Fours were a complete flop. I too ended up throwing them in the garbage. The cake was tasty. I cut my cubes, made layers and fruit glazed them. The fruit glaze never did dry properly for me. (I didn't know to put them in the freezer). I sandwiched them together, which the instructions indicated was an option. Then, when I heated the glaze to lukewarm-- as the recipe instructed-- and poured it on a few of the cakes, the upper layers slid off the bottoms and the whole thing looked like a wreck. It acted too thick (it was), and there was no way that so much icing on one tiny cake was going to be delicious. Did I dare thin out the icing with more water? What if I heated it more than lukewarm-- would the heat ruin the cakes? I just didn't know. I tasted the icing on its own and to be honest, I thought it was terrible. When I finally took a bite out of one of the cakes, I realized it wasn't worth eating. Even my twins who are "sugaraholics" didn't like them. That's when I tossed them. I will make them again, but I'll look for a tastier icing, and I will include reviewers tips in my preparation. Jen, I am looking at the photobucket pics and I cannot stop laughing!!!!!!! It's 1 in the morning and I´m afraid to wake the neighbors, What happened? Great! Cant wait to try them I've always wanted to, so I'll give them an Excellent because they look DELICIOUS! I am a very good baker, and very good cake decorator, i've been doing it for about 8 years, i've made these before from several recipes always trying a better and or easier way. This was the worst one so far! The frosting was too sweet, the filling was too sticky, the cake was good. I cut my cake the right way, put it inthe freezer, everything. The icing over the top just didt go on right, i ended up letting my family eat them because they just weren't presentable for the function i intended it for! It was a waste of 4 hours. Perfect!! I really don't know why people are moaning about this recipe! It works very good! Just remember! practice doesn't make perfect....... it's perfect practice that make's it all perfect!! Keep the baking going guys! Yeah, I learned the PROPER way to make petit fours, also they are not just cakes and cookies, they are a dessert that is two to three bites big. Petit fours are not supposed to be this sweet even for fondant icing, the glaze is completely off, this is most definitely not for beginners, thank god for culinary school. I read some of the other reviews and I don't understand why people are complaining about how much time and being too sweet, it is obvious something you did wrong, because this recipe works well. Obviously all of the people that are saying this recipe is too sweet have never had true petit fours. Petit fours are supposed to be extremely sweet. I personally don't put the fruit glaze on them and I use a different pound cake recipe that I have reduced the sugar in so the not so sweet cake off sets the sweet icing. This cake was a basic cake...nothing wrong with the recipe. I do not recommend box cake mix as they are very crumbly and soft. If you want easy-go buy a frozen pound cake-simple. It won't crumble-you invest no time-and it tastes OK...so then why are you even bothering looking for a recipe that requires some investment of time? As far as the icing-this recipe worked, BUT-if you want simple....get a bag of powdered sugar (and for those complaining that it is too sweet-it's sugar, no mystery as to why it is sweet). So, sift some powdered sugar, add A LITTLE bit of corn syrup, and then milk-drops at a time. Whisk it, blend it with a spoon-whatever makes you whine less, and come up with a consistency that works for and with you. A tiny dash of salt will take the overwhelming sweetness to a more tasty balance. I didn't provide measurements because YOU might live in Hawaii, in Colorado, Texas or Guam-what do I know? What I DO know is that humidity, altitude and the lack of humidity all impact the outcome of a recipe. I say try the cake-it's a basic recipe, and try your own hand at making your own icing. Omit the jelly if it scares you...the cake will taste good regardless if it has it! And go buy the flowers-Hobby Lobby and Michaels sell instant flowers-there are even live fresh flowers that are non toxic (be sure to do your homework and MAKE sure that they are food safe so you don't kill anyone). You can also top them with a berry that has been coated with sugar. So go, be creative and fear not failure, it's how we learn. As for the photo bucket cakes-sweetheart....I don't even know how you accomplished that-Michaels offers basic cake making AND decorating classes with recipes that have been proven to work! Baking is not easy and ingredients aren't always as fresh as we hope they are when we buy them at the store-so chalk it up to that and be creative....impress your family and friends-impress yourselves. I am NOT a baker, so I was terrified after reading all the negative reviews! Unfortunately, I had already purchased all the ingredients so I was past the point of no return. I was maticulous with the directions, often googling terms I did not understand ("beat eggs until soft-white peaks form", "fold into batter"). I say all this to illustrate how clueless I actually am when it comes to baking...However, the cake turned out beautifully! And the icing, although extremely messy, was divine! I must say also, that my tiny cakes were quite pretty and the best part of my husband's birthday party :) I wish I could add a picture to show you how nicely they turned out! I would suggest this recipe to anyone, with patience :) I did let my cake chill in the frig for 24 hours before icing it and never had any trouble with crumbling or excessive stickiness. I can't wait to make them for Christmas. Things went great...up until the point of the icing, surprise! The cake is delicious, the glaze (when applied with a brush) no problem, layered them, no problems with crumbs. This icing was not only too thick it is also not very good! Luckily I only tried it on a few squares so all my hard work was not in vein! I will be using rolled fondant from now on. If rolled thin enough and spread wide enough I wouldn't imagine any problems. At this point in the project and the night though I believe I will spread on some buttercream icing (which will be messier to eat) but there's no turning back so...what do ya do? Firstly... 9 frigging cups of sugar?! Haven't made this yet but... I think I just got diabetes looking at that quantity. There are some.. milder recipes out on the net. - Use a flavoured ganache between layers.. more yummier, not as sweet as the syrupy tasting filling AND a better hold. I too am a long time baker, having done weddings, graduation and retirement cakes and goodies for years. I actually felt sorry for the lady that had the miserable experience with this recipe. As far as the reviews, this mixture of good reviews and bad ones makes me a little leery of using it at this time. I need finished products in four days. I will either keep looking tonight or just do a double layer sheet cake and priss it up. But, thanks. I may try it when I have tons of time. I always have enough grandchildren to eat the 'mess-ups'. Just finished making the Petit Fours. The cake turned out fantastic and I was able to get the icing on well enough by dipping each of the sides and then pouring some icing on the top. All in all they looked yummy-but were WAY too sweet for my taste. I cut the cakes in three and applyed both a simple syrup and jam to each layer-a few petit fours ended up falling apart, but the majority were fine. My friends and family enjoyed them though so it was ok but next time will definitely try using marzipan! I loved this recipe, it was so sweet so I decided to make my own cream cheese and honey glaze , they turned out great in the end though! I have been baking since I was 5 years old, I'm 69 now, you do the math. I was very pleased to find this recipe. I have read every single review, too many complaints, lots of positive ones as well. I just don't want to spend the time I have left on this earth,(just being funny) to run the risk of problems. I'm going to check around for other recipes. I still may come back, definitely will takes the ideas from you great bakers. Have never heard about the vinegar trick. Thank you! It's almost ten o'clock in the evening, so I think I'll try something easier. I just spotted Mocha Brownie Bites. I'll check them out. Well HAPPY BAKING FOLKS. Well, petit fours are my favourite, all the positive and negative reviews intrigue me. I'm an okay baker, but this is my first time at making petit fours. so here's going folks, will try them and then let you know how I go. It is going to be a lot of work, but so worth it. Well, I am writing in advance as I haven't tried these yet. I don't think I will use a jelly glaze according to the one review, it might make the cake soggy. I am going to use a pink chocolate ganache over the cakes...so I don't have an icing issue. hope it works. I have used ganache before and it does better than icing. Made them the first time today. No mess, no fuss, lots of fun! Made some substitutes as we don't have all the exact ingrediants in South-Africa, but it still came out great! Do not understand any of the bad reviews! I'm smiling! Do you think I can make these coconut flavored by using coconut milk instead of regular milk? Excellent recipe. I love trying new sweets and for my first try, they were awsome. Had lots of fun mixing and making different colors and decorating them. This is a must-try recipe! So I am most definitely not a beginning Baker and I had a very difficult time with this recipe. I was prepared for the time consuming part but not for the overwhelming sweetness of the frosting. I'm glad I sampled it before putting it on my little cakes which I would recommend baking in small flat sheets instead to create the layered look these little cakes are known for. I followed the directions to a t and found that adding 2/3 the sugar and twice the almond flavoring to the frosting made a nice marzipan-ish like flavor which went well with the cake. After several tries to frost them evenly I gave up and since my color choice was a soft green I simply added more green to make it eerie then splattered orange and black to make some halloween-ish treats for adults and they were a hot seller! I was making an order for a rehersal dinner that i was getting paid to do, and she ordered petit fours and not only was the glaze extremely sweet, but they looked like the other womans in here who shared a picture. Needless to say I was very upset and frustrated. i had to throw them all out and make something different. I spent alot of time and money and i got nothing in return. I have to tell you all that I have made several attempts at Petit Fours with results similar to the lady that posted a link to her pic. This icing was the first recipe to produce good results!!! I did add the dash of salt as one suggested and it tasted delicious. The key was keeping it on the double boiler and thinning if necessary with a little more water to keep the consistency thin enough to pour. I used three coats to get a good cover, but with the salt it was not too sweet. To coat the sides, as some were asking, i just poured slowly over the edges so it ran down the sides, also if necessary, i did smooth the side with a knife dipped in warm water before icing set. I didn't rate excellent because most of the helpful tips were in the comments and not the recipe. Over all, Happy to find a functional icing! As a pastry chef, I make Petit Fours all the time and will say, they take time and practice, but once you have it under control the end result is well worth it. A few tips to help the layers stick and to get nice smooth results. First off, do not add any water to the jam! This will only make the jam slippery and watery and not help in its adhering quality, also remember that as the jam is there for taste, it is mostly acting as a glue so put a VERY thin layer, thin enough so that you can see the cake right through the layer of jam. As substitutes for jam you can also use ganache, praline or anything of that consistency. Secondly, freezing or cooling in the fridge definitely helps the crumb factor, but if you want an extremely smooth top layer, roll out a very thin layer of marzipan and place on top of your top layer which should be adhered with another thin layer of jam. This will help you get the very smooth looking top and a much cleaner appearance. The last tip is when it comes to fondant, if you don't make it on a regular basis, I would suggest either buying poured fondant and heating it to 95-100 degrees over a double boiler with a few teaspoons of water until the fondant runs fluidly, or when making the fondant yourself, be sure to add the powdered sugar in smaller increments when you get it to a consistency which is very fluid and not super think you know it is right. Always warm it over a double boiler to 95-100 degrees adding a few drops of water when it becomes thick again, this is the only way you will get to coat the cakes in the pretty way that you see in pictures. Practice makes perfect so try a few different ways to get the results the way you like them, but with these modifications you will be able to take this recipe to amazing levels! If one follows the recipe they will be Excellent. Sorry Jen but following a recipe mostly does not make the final look and taste the way it should. This is baking not cooking pasta sauce. This was the best if you are an expert at cooking hard recipes. Never make this if you aren't a good cook and you don`t have a lot of time to make it. These are amaaaazing! The texture of the cake is perfect, hardly flakes at all. Some people were saying the icing was too thick, I didn't think that at all. I didnt have as much confectioners sugar that I needed so I split the recipe. The top parts came out just like the picture but obviously the sides didnt get as much as they were supposed to. Other than that (Which was my own fault) they are perfect! Not a "true" Petit four and not a good recipe. They should not be overly sweet. It is very hard to find a good recipe here in America as they all leave out the main ingredient...Rolled almond paste. But at least this recipe DID press the cakes together. I will give them credit for that !